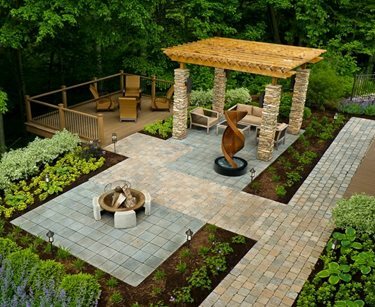 Pavers are a popular choice for backyard patios. 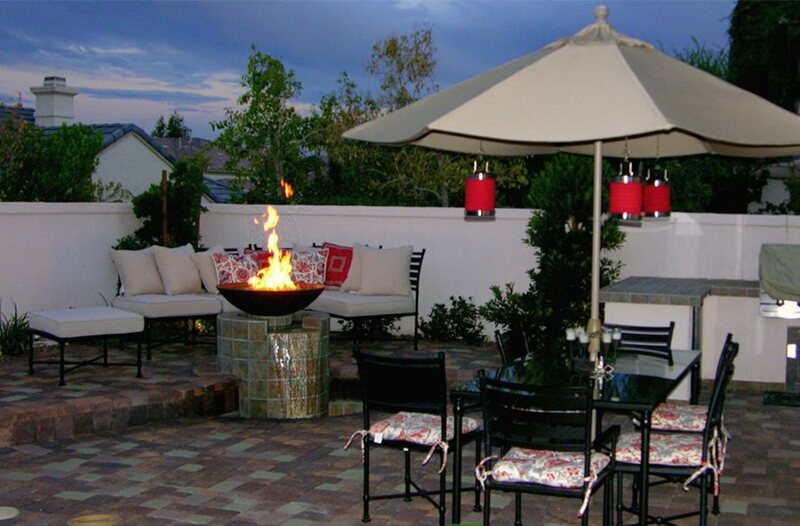 They provide a beautiful, custom paving solution that installs quickly and is ready for use as soon as the project is complete. 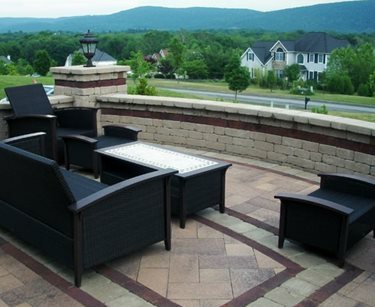 Pavers allow for a lot of design creativity and can be used on small or large patios. 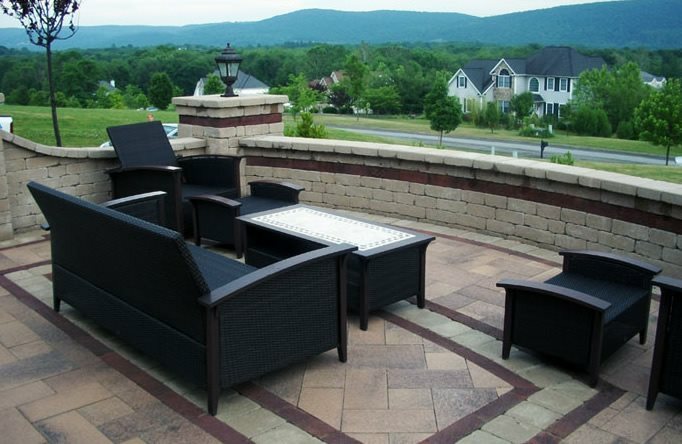 Patio pavers are made of concrete, brick or stone. They come in a variety of shapes and colors. 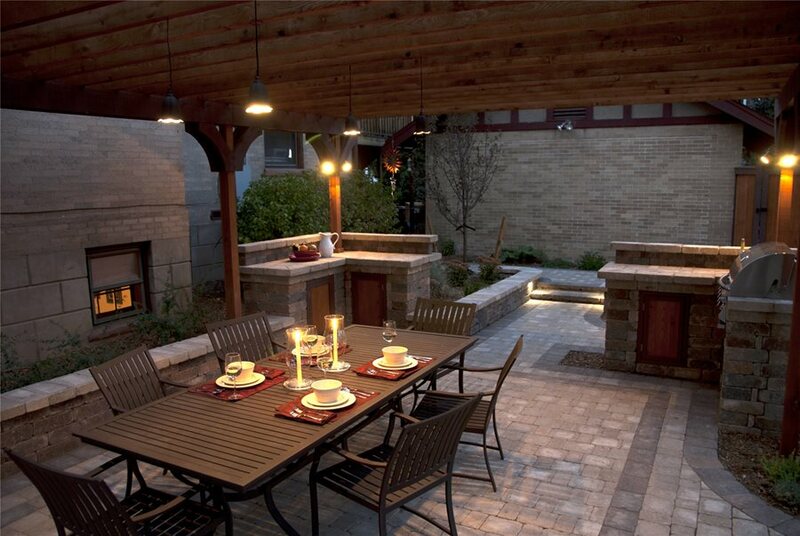 However, the real draw of pavers is that they can be laid in striking patterns. 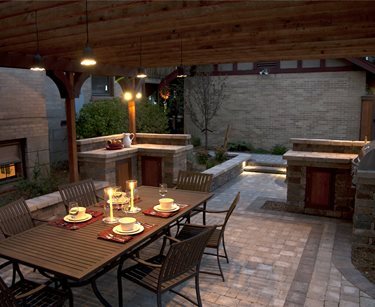 Precast concrete pavers have without question the largest range of shapes and sizes available in a single material. 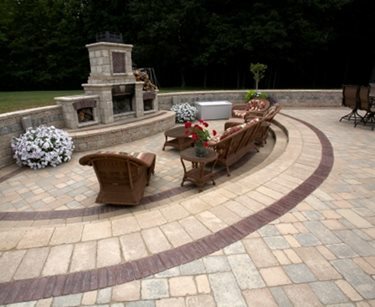 The lovely curved steps are enhanced by a series of bands in the paving that accentuate the geometry of the space. 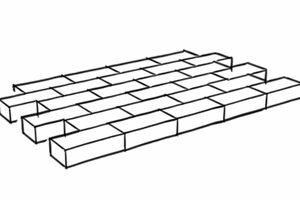 These large light tone pavers are further emphasized by a pair of dark bands of brick like pavers set on edge that may disguise slot inlets to an underground trench drain. 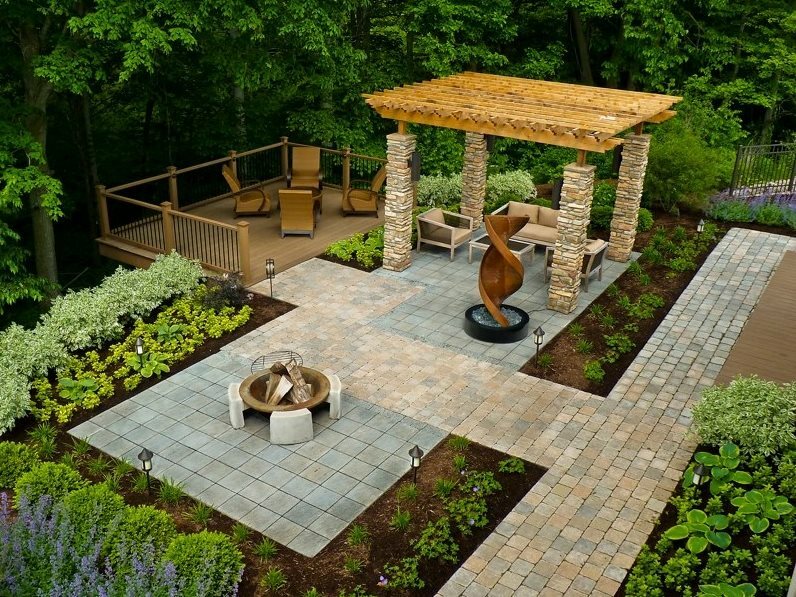 Fields beyond are composed of four different pavers, square and rectangular, buff tones and steel gray which stand out in striking contrast against the rigid step masonry. While so much variety in a limited space may seem overdone in concept, here in practice we learn that it is clearly not so. This patio, clearly designed to be viewed from above is an exceptional example of modern subliminal design through the use of paving stone. The uniformity of manufactured precast pavers provides a very solid surface for the wheelchair bound resident because there are no mortar joints that can make traveling a jarring experience. Tightly set clean edges allow the beauty of individual units to appear separate for variation on the ground plain. The ability to blend the large gray square units in the main field with earth tone directional variation though to the cantilevered deck beyond provides a sense of division without barriers. 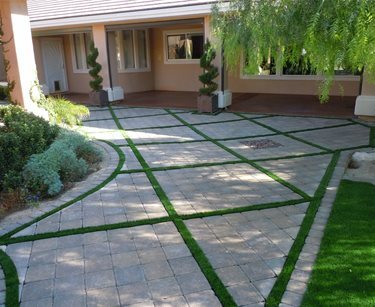 The arid climate and limited water supply of the far west drove development of truly believable artificial turf. 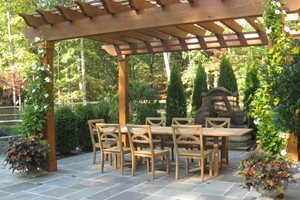 Nowhere is the value of this innovation more appreciated than the ability to utilize contrasting bands within fields of simple square precast concrete pavers. Pavers more easily cut than stone make this diagonal application a fine opportunity to bring in artificial turf in a dynamic way, particularly at a site too shaded to allow real grass to grow. 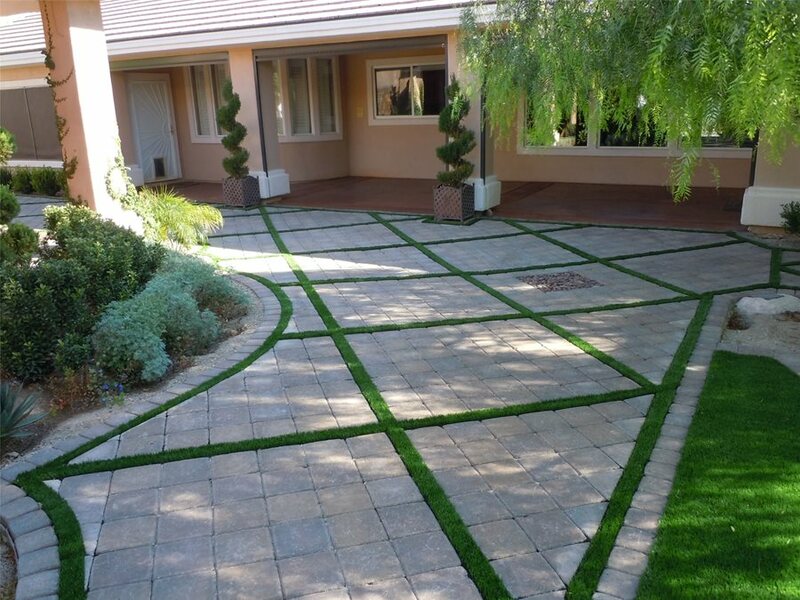 Perhaps more important is summer heats paving to such a high temperatures that virtually no living plant is able to survive, yet this artificial turf lends a beautiful lush look amidst the rustic Southwest feel of tumbled pavers. 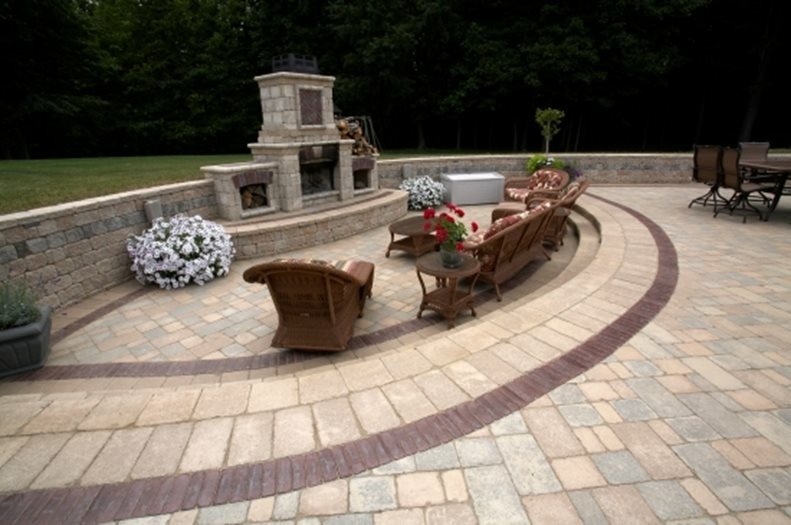 The most recent innovation in paver technology is the development of multicolored patterns that provide a great deal of variation in the surface. 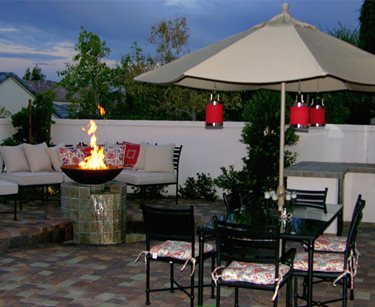 The importation of brighter natural stone units from Asia is also driving paver manufacturers to keep up color wise. 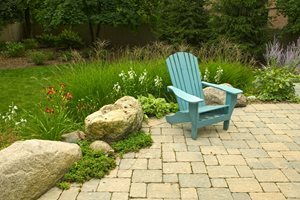 Be careful when working with bold paver coloring as some believe this latest trend may ultimately date a project more than any other paver design choice.